Electronic Kit School. - Usually camera and other electronic devices using rechargeable cell battery like a nickle-metal hydride or mentioned with NiMH battery. This battery is cheap and has a flow rate capacity of the cells and also can replace the generic battery immediately, make this battery widely used today. There are many reason people generally choose to buy charger battery like the budget to buy, fast and slow to charger, and other. But, for many electronic student and hobbyist more interesting to build it by their self to get more satisfaction. 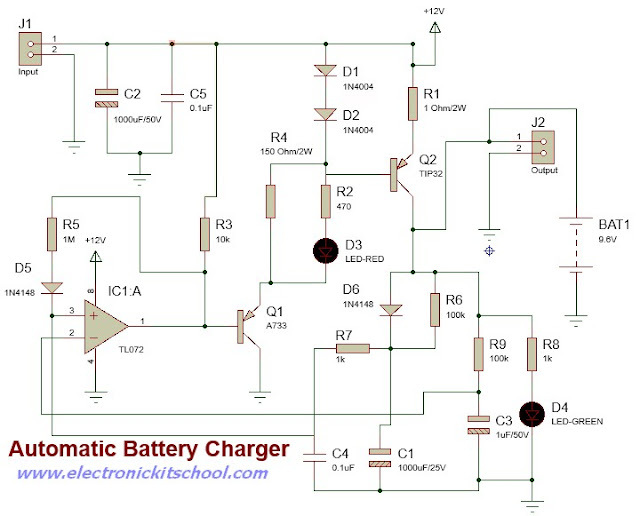 Circuit like in Figure 1 above show you about 12V/800mA Automatic NiMH (nickel-metal hydride) Battery Circuit Based on TL072 IC that can charger your NiMH battery 1 - 10 Pcs depending the input voltage given. In this circuit has 2 LEDs (D3 and D4) indicator served as show the charging status and LED will be off when the battery is fully charged. Other function of this LED is indicate that the circuit is connected correctly to give perfect working. The input voltage that can be given in this circuit ranging from 12-16 volts and use current to charge to 800 milliamperes. The battery NiMH that will be charged should be connected to the output of this charger circuit J2. Note to make sure the cell battery should be correct to connect with right popularity. The D4-LED will light when it right and will go out when it wrong. As the main component in this circuit, IC1-TL072 get some voltage from the battery and will be compared of this voltage through between pin 2 and pin 3. Assume that the voltage from battery to charge each other cell is still low. This condition make the output from IC1-TL072 will send to a transistor Q1 A733, Which acts as switch on-off working to transistor-Q2 TIP31, it will make the current can flow to the battery. In here LED1 will show the charging status when the circuit is charging. The output of IC1-TL072 through pin 1 will not send to Q1 transistor or stop working when the battery is full. This condition also will cause the Q2-transistor stop working. LED1 indicator charging is off to display when the battery charging full enough and end the charging. Resistor R1 is a current limiter that in this circuit is determined at 800mA. So now you can try this circuit of 12V/800mA Automatic NiMH (nickel-metal hydride) Battery Based on TL072 IC to give you more information.